Reliance Digital Experience at R-City, Ghatkopar was organised along with indiBlogger. Why Choose Reliance Digital ? 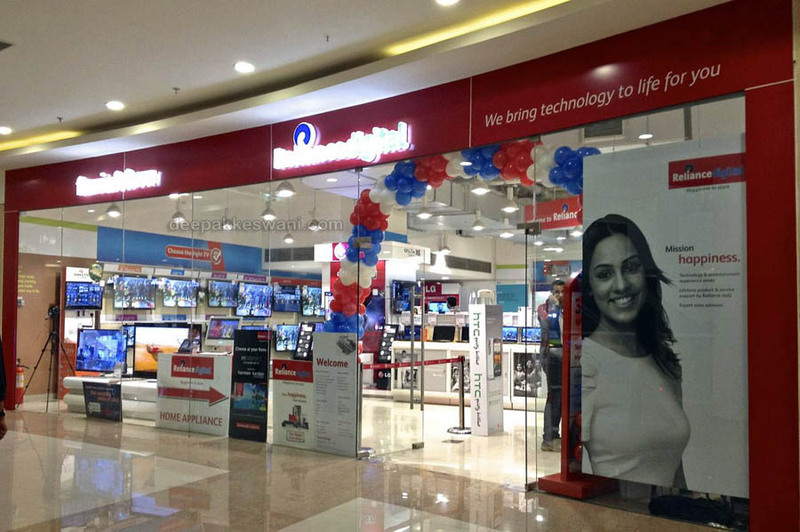 Reliance Digital is one stop multibrand show room where you can get all the kind of Electronics items with the trust. 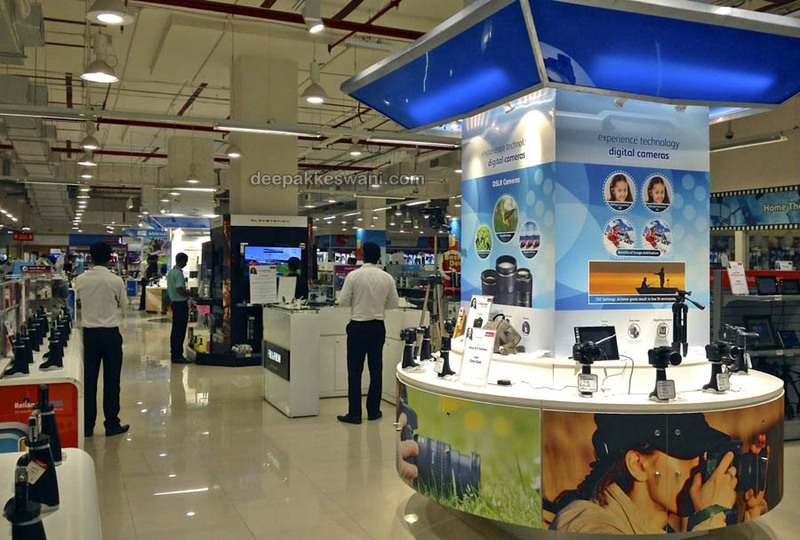 Reliance Digital is part of Retail section of Reliance Industries. Trust as build by Mukesh Ambani ventures. Reliance Digital is reseller and partner with Industry leaders like Apple, HP, Lenovo, Samsung, Sony, LG & many. 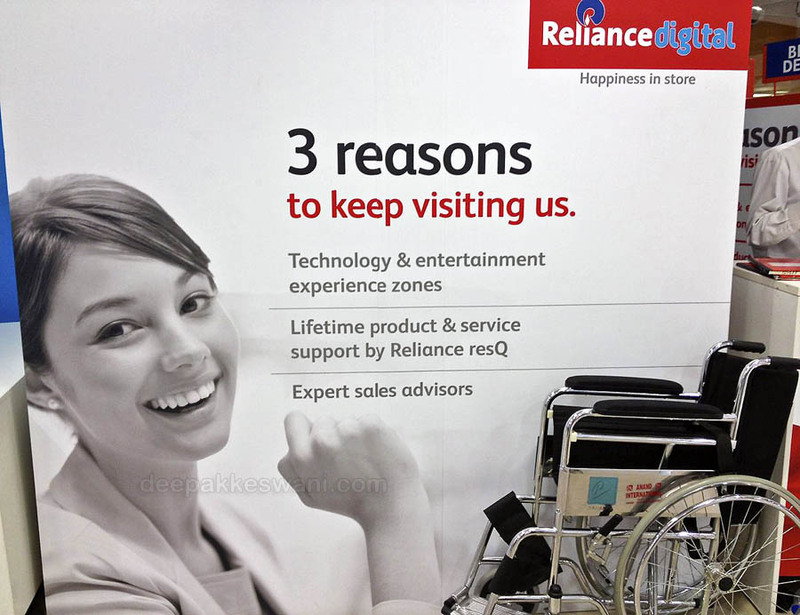 These are the three offerings or reasons you keep revisiting Reliance Digital show rooms. Technology & Entertainment experience zones. Lifetime product & service support by Reliance resQ. Why Reliance Digital in R-City ? Reliance Digital in R-City Ghatkopar is strategically located in the center of Mumbai with easy reach and ample parking. Ambiance and spacious look keeps customers at comfort while shopping their needs. There is 15,000 sq ft. space fully utilised in demonstrating LCD/LEDs & Plasma TV, Mobile, Tablets, Laptops, Desktops, Printers, Home Theater Systems, Gaming Zones, Laptop Zone, Home appliances. Store is open 7 days a week from 11:00am to 10:00pm. How to reach here ? Though officially R City is listed in Ghatkopar, but actually R City mall is in the center of Vikhroli and Ghatkopar station on west side. You can choose any of the stations if you are coming by train. It is on the LBS Marg road. Address: Reliance Digital, R City, First Floor, FF 52, Phase 2, LBS Marg, Ghatkopar West, Mumbai. 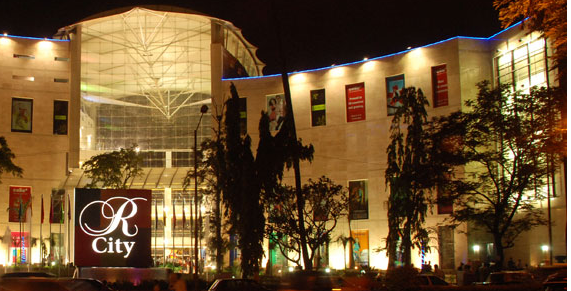 R-City is one of the biggest mall around in Mumbai and almost feels like city. There is ample amount of parking space available in case if you are coming by car. There is new wing on the right side of entrance. Thats where you’ll find the Reliance Digital store. If you are coming by road through public transport, this is how you’ll enter the R-City. Take right hand side escalator to reach on first floor. 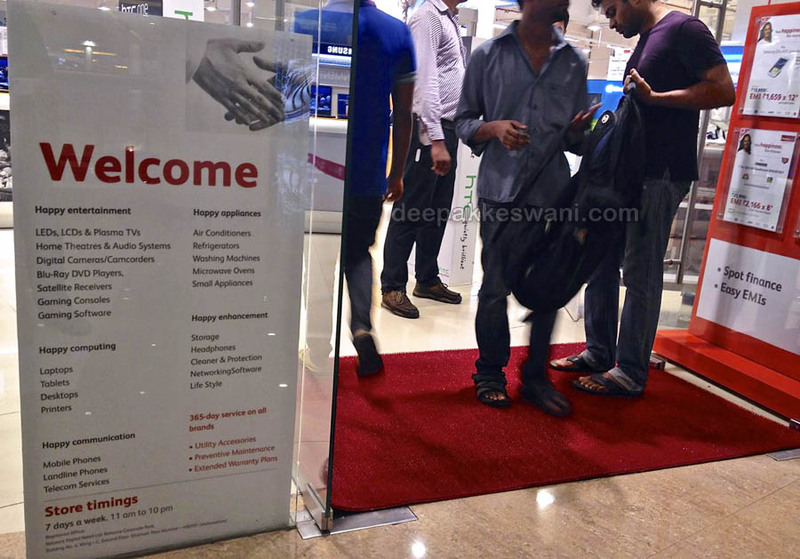 Reliance Digital is near to Escalator. Showroom Entrance is designed very lively where you see everything in action. Camera recording your view and projecting on big screen. Laptops, Desktops & Tablets with demos makes it very tempting to checkout new technology products. Just enter to find experts waiting to help you find right product as per your needs. Store is divided into different segments to make it easy for customer. Wheel chair also available for physically challenged person to assist while shopping. 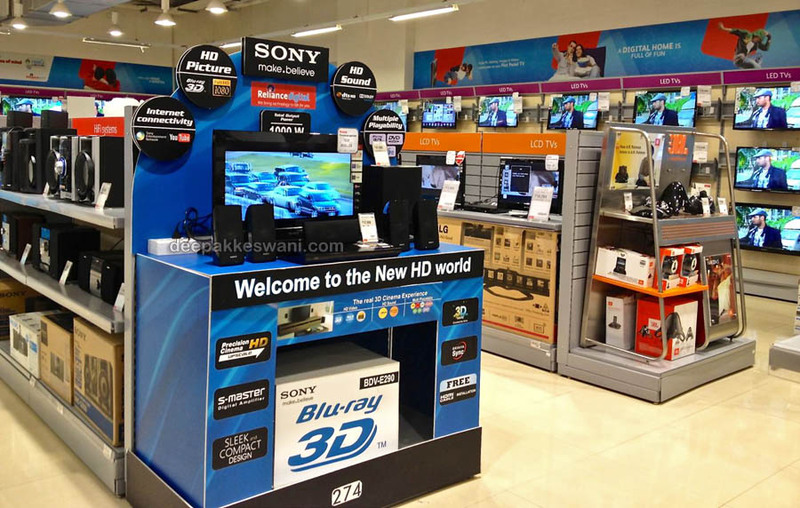 Sony High Definition 3D demo center where you can experience 3D movies from Blu-Ray Player by wearing 3d glasses. 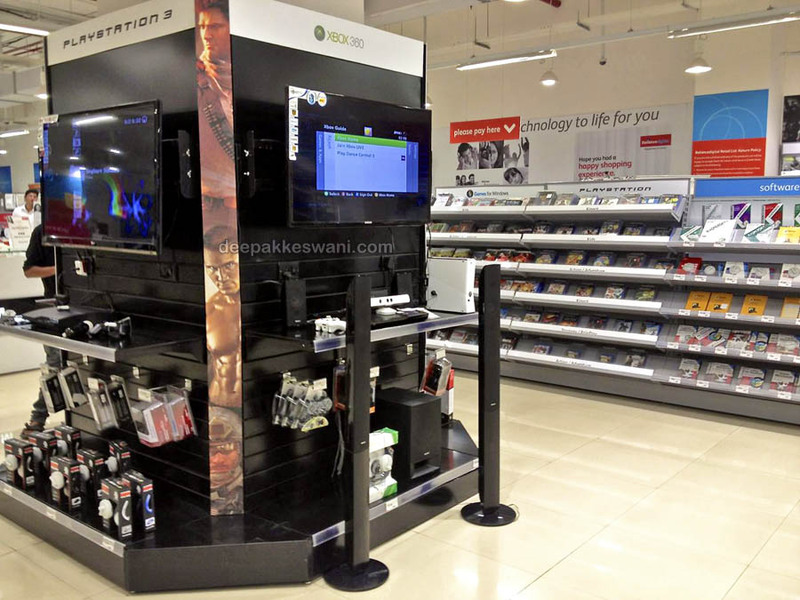 Gaming Zone with consoles to experience Xbox 360 with Kinect & Sony Playstation 3 and 2. Mostly occupied by kids playing. 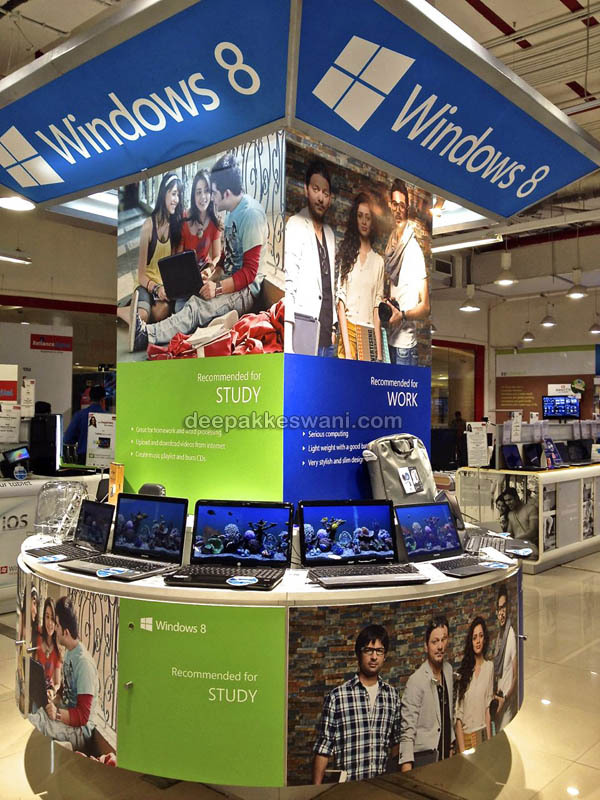 These are four pillars of demonstration in the center of showroom, which includes, Windows 8, Mobile Phones, Gaming Consoles & Professional Photography equipments like DSLR & tripods. 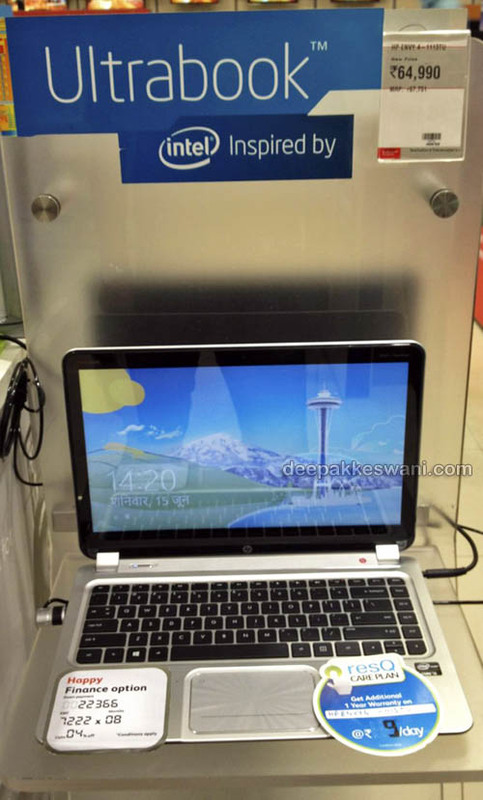 Laptops with Latest Windows 8 Operating System offering. High Performance & lightweight Ultrabook by HP with Finance options & resQ plans. There is also Home Theater room where you can experience choice of Home Theater systems and feel the clear picture and surround sound, sitting on comfortable couch and remotes in hand. There is plenty of staff to assist each customer with personal touch. They will offer you Indian Style Namaste on entrance and help you find what you are looking for. Language is not a problem you can speak in Hindi, Marathi or English. In case if you have technical query there are few specialists in each area to provide you solutions to choose right product. Reliance Digital Provides in house service and support which means when you buy products, service and warranty is covered primarily by Reliance. Reliance resQ is team of specialist to take care of products during warranty period. You can even extend the warranty of products and use these without any worry for many years. 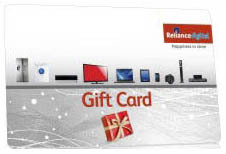 Reliance Digital gift card is perfect way to gift your friends and relatives, when you really can not think about what will be suitable for them. You can add any amount of money to this card starting from Rs. 500 to Rs.10,000. This can be used for shopping at any Reliance Digital or Apple iStore shops. There is no processing charge. Full amount can be redeemed for shopping products. Reliance Reconnect is their own range of consumer electronics & appliances under the brand name ‘Reconnect’. These are sourced from trusted manufactures and sold at very competitive rates to consumers. All the Reconnect products also come with 2 year warranty through resQ service. During my visit to Reliance Digital, I enquired about 2 TB external network backup storage & Apple Time Capsule. 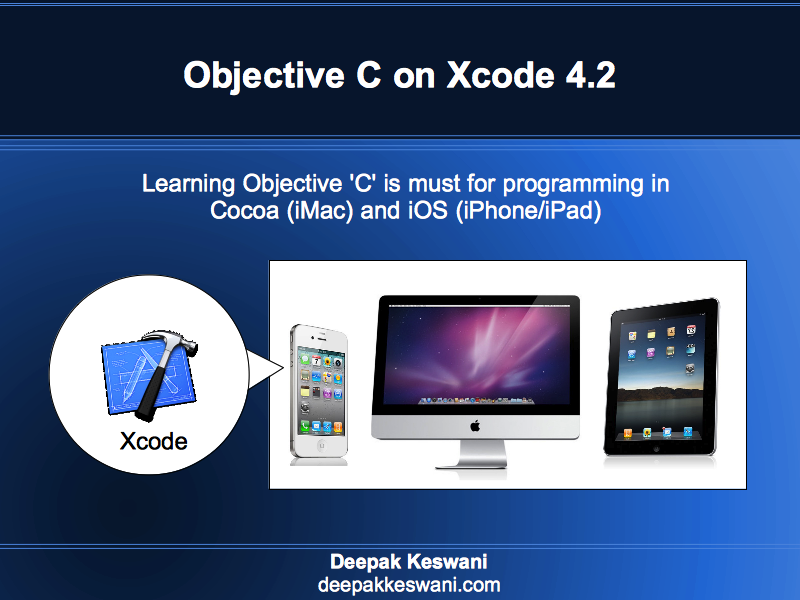 I thought it is complicated topic since inter-operability with Mac is not known to many. To my surprise there was one representative who could show the backup in action on one windows machine and guided the process for Mac. Overall it was learning and enjoyable experience being there.